The ninth and last day of Navratri festival is dedicated to Goddess Siddhidatri form of Durga. She is worshipped on on April 14, 2019 during Chaitra Navratri and on October 7, 2019 during Sharad Navratri. The day is also observed as Ayudha Puja and Saraswati Puja in many regions of India. Mahanavami is also observed on the ninth day. In Siddhi Dayini or Siddhidatri form, Goddess Durga showers knowledge which makes each soul realize Brahman. Goddess Renuka and Goddess Matangi form of Durga is also worshipped on the day in many parts of India. 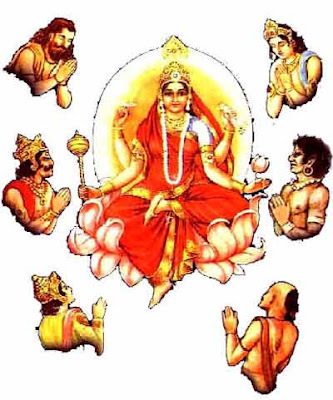 Goddess Siddhidatri is depicted as having four hands and she is surrounded by Siddhas, Gandharvas, Yakshas, Demons and Gods who are worshiping her and bathing in the light of knowledge she provides. Ayudha Puja and Saraswati Puja are observed by many communities on the last day of Navratri and many people do not touch tools and books on the day as they are kept for Puja. Mahanavami is observed in Bengal, Orissa and other parts of Eastern India. Kanya Puja or Kumari Puja – worship of young girls – is observed on this day in many parts of India. Goddess Renuka and Goddess Matangi form of Durga is worshipped in western parts of India. As per astrology, Siddhidatri Devi has influence over Ketu Navagraha. Those facing trouble in life due to the bad positioning of Ketu Graha in horoscope will find relief after offering prayers to this form of Goddess Durga. This form of Goddess Durga is worshipped by those who want to drop all kinds of attachments. They drop everything and merge in the Supreme Truth. This form of Goddess should be worshipped by those who are on the path of spirituality. Those who wants to attain liberation and true understanding of the world. She helps a devotee to come out unscathed from the world of Maya. She should be worshipped facing the northwest. She is offered white and red color flowers. She is offered lotus flowers by those wishing to attain various Siddhis.